Frito Lay Good Fun! 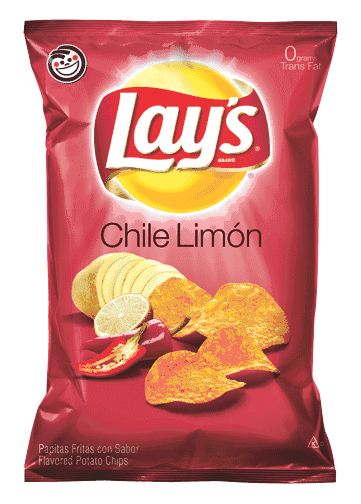 Naturally delicious Lay's Chile Limon potato chips are a great snack with an irresistible flavor! It all starts with farm grown potatoes, cooked in all natural oil with a dash of salt. Then we add the all natural spice of chiles and the zing of real lime. So every Lay's potato chip is perfectly crispy and delicious. Happiness in Every Bite! Lay's Chile Limon have no artificial flavors, no preservatives, no MSG, 0g trans fat & made with all natural potatoes and seasonings. Ingredients: potatoes, vegetable oil (sunflower, corn and/or canola oil), chile limon seasoning (spices [including chili pepper], salt, yeast extract, maltodextrin [made from corn], sunflower oil, corn syrup solids, citric acid, sugar, onion powder, lime juice, garlic powder, natural flavor, milk protein concentrate, paprika extracts and lemon juice). Frito Lay buena diversion! Naturalmente deliciosas las papitas fritas Lay's Chile Limon son una botana irresistible! Todo comienza con papas agr�colas cultivadas, cocinado en aceite natural con una pizca de sal. Luego agregamos todas las especias naturales de los chiles y la chispa de lim�n. Todo para que todas y cada una de las papitas Lay's sean crujientes y deliciosas. Felicidad en cada mordida! Las papitas Lay's Chile Lim�n no tienen sabores artificiales, ni conservadores, ni MSG, tienen 0g grasa trans y estan hechos con papas y condimentos naturales. Ingredientes: papas, aceite vegetal (aceite de girasol, ma�z y/o canola), condimento chile lim�n (especias [incluyendo chile], sal, extracto de levadura, maltodextrina [de ma�z], aceite de girasol, solidos de jarabe de ma�z, �cido c�trico, az�car, cebolla en polvo, jugo de lim�n, ajo en polvo, saborizante natural, concentrado de prote�na l�ctea, extractos de piment�n, y jugo de lima). I absolutely love these chips they used to sell them in 7-11 but no any more so I hunted them down and now I can order them and have them shipped right to my house. The best chips Ever! So good I had to order them online.... thank you MexGrocer! I'm regularly not a big potato chip fan but these Chile Limon flavored potato chips have completely captured me. I LOVE these and have not tasted anywhere any other chips that come even close to how tasty these are. LOVE LOVE LOVE these chips! Moved from California to North Carolina and they don't sell them anywhere around here! Thanks for making it possible for me to get them!